Yesterday was my husband and I’s 1st anniversary. We’d been discussing what we should do for a few months, floated the idea of going to our tiny town’s new fancy restaurant, Sostanza, and mused over our options. – We can buy alcohol much cheaper at the liquor store and get exactly the brand and types we want. This is doubly important for me as I generally can only drink sweet wines and ciders. Plus, no need for a designated driver when you’re already home. – We can put together exactly the food we want at a fraction of the price of going out. So, we decided on a menu. We decided we’d cook over two days, preparing the more labor-intensive items the day before and the easy stuff on the day of. You can read more about the recipes via the links, though the cake will be discussed further in a future post. For today, I thought I’d share buljons with you. Buljons and buljona pīrādziņi are an interesting combo in Latvia. Buljons, as you might expect since it sounds like bouillon, means broth. It’s typically served in a mug with chopped green onions along with a pastry filled with cheese or meat (or both). It might seem a little weird to drink broth as a drink rather than a meal, but try going out and shoveling over half a foot of snow before coming in to a steaming mug of deliciousness. Suddenly, all will be right with your world. Guaranteed. For the buljons itself, I used the broth from the Daring Cooks Pho challenge and based it on a dark, rich chicken stock we made the day before. When we did that challenge, my husband absolutely loved the broth and asked me to make it again so he could have it this way. We had saved a chicken carcass from a roasted chicken meal and found some chicken thighs and drumsticks on sale, so we decided to make a big batch of stock – for us, about 4 quarts when finished since it’s the maximum our equipment allows. This time, the stock came out beautifully rich and nut-brown. It was absolutely perfect. There are two things I attribute this success to: frying the chicken to brown it first and letting it all cook for 5 hours. 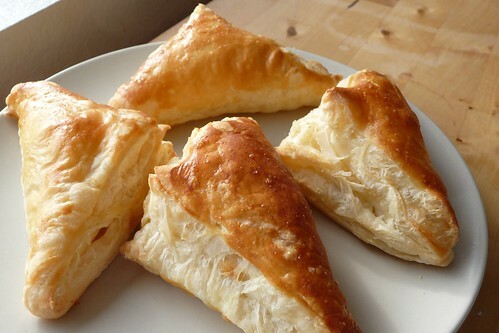 As for the pīrādziņi, they’re actually very simple, just a bit of puff pastry folded around a cheese or meat filling. Now, Latvians have their own version of laminated doughs that seem a bit easier than the French version I know and refuse to tackle in my tiny, cramped kitchen. I’m planning to try the Latvian version later this winter, but for yesterday, I decided just to use a sheet of store-bought puff pastry since we were cooking so many different things already. It’s really simple to do — take some thawed puff pastry, cut it into squares, fill the squares with your favorite cheese, fold them in half to make triangles, then brush them with beaten egg and bake at 400F for 15 minutes until golden brown. Easier than pie. It was a great dinner and it’s been a great year together. Here’s to many more! This entry was posted in bread, latvian, meal planning, recipes, untranslated. Bookmark the permalink.